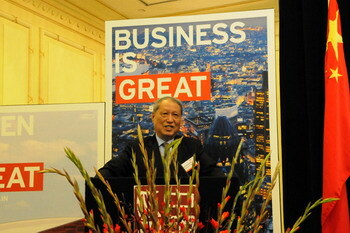 On November 5, a China-UK business luncheon was held at the London Millennium Hotel. Over 60 guests attended the luncheon, including Mr. Cheng Siwei, Vice Chairman of the Tenth Standing Committee of the National People's Congress of China, Mr. Zhong Shan, Vice Minister of Commerce of China, Mr. Wang Yingfan, former Vice Foreign Minister of China, Mr. Cong Peiwu, Chargé D'affaires of the Chinese Embassy in the UK, Professor Zhu Xiaoming, President of China Europe International Business School, Mr. Ken Clarke, British Minister without Portfolio and Trade Envoy, Lord Peter Mandelson, former British First Secretary of State, Lord Charles Powell, Member of the British House of Lords, Sir David Brewer, Chairman of the China-Britain Business Council, and other Chinese and British celebrities from all walks of society. Vice Minister Zhong Shan and British Minister without Portfolio Mr. Clarke addressed the luncheon. Vice Minister Zhong Shan said, "The UK is an important partner of China in Europe. A sound development of China-UK economic ties is in the common interests of the two countries. Faced with new challenges, the two sides need to strengthen the bilateral trade and economic cooperation. Together China and the UK will make a joint effort to achieve new breakthroughs." He also called for greater efforts from Chinese and British entrepreneurs to maximize their exchanges and cooperation, so as to promote further development of the trade and economic relations between the two countries. In his speech Mr. Clarke said "Britain is one of China's major trading partners. Our strengthened economic ties driven by the growth of China has produced more of a two-way investment between the two countries. We warmly welcome the trade and investment from China." 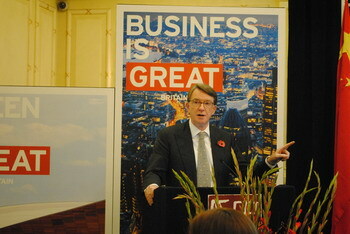 Mr. Cheng Siwei and Lord Perter Mandelson delivered keynote speeches. To introduce the current economic realities and characteristics of China, Cheng Siwei said that China has shown a strong commitment to shifting its growth pattern and will make more efforts in helping the people increase their incomes and improve their quality of life and in boosting domestic demand for new growth. The stable growth of China will provide more opportunities to reaffirm the China-UK trade and economic ties. Mr. Mandelson emphasized that the China-UK economic ties are of great importance and that China's growth will bring numerous opportunities to British businesses. He said he hoped and believed that China-UK trade and economic cooperation will have a prosperous future. At the luncheon, entrepreneurs and celebrities of all circles of China and the UK exchanged views on how to explore new ways of cooperation. As part of the activities of the exhibition Contemporary Seals by Li Lanqing, this session aims at enhancing the communication and exchanges between political leaders, entrepreneurs and businesses of the two countries, facilitating the practical bilateral economic and trade cooperation and promoting new development in the China-UK economic relations.